While I write a show recap for Metro-Living-Zine (read it HERE), I always choose a few students to feature in a solo Q and A. It's always several things that come together when selecting a student. 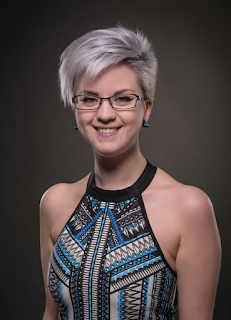 I met Sam Stringer originally at Vancouver Fashion Week where she was plying her talents as a photographer and was extremely impressed with her eye. Her backstage captures in particular were striking. 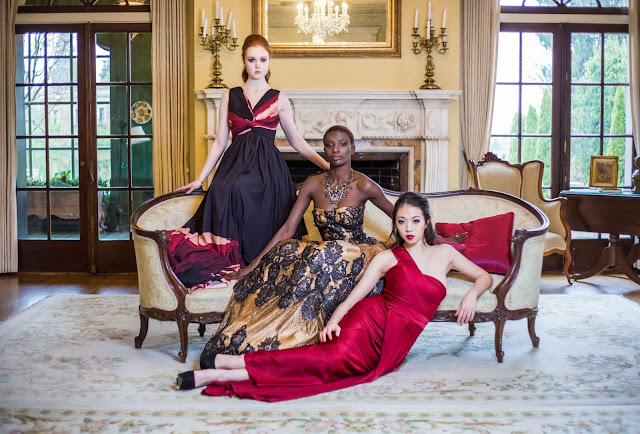 'Vesuvius, the premier collection from Sam Stringer, showcases luxurious evening gowns for black tie events. 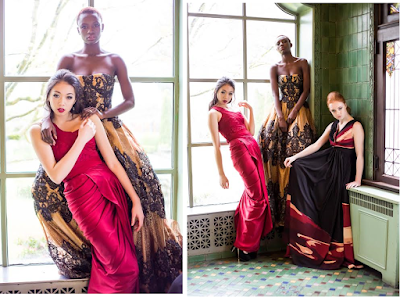 By providing the creative, motivated entrepreneur with an artistic extension of her brand, Vesuvius gowns combine traditional mastery with modern aesthetic. Vesuvius features a signature dress, Joan, created in collaboration with local artist Jack Wass, reinventing his original painting “Come Home” into a unique gown." I was born in Victoria, BC, and I lived there until I was 18 when I moved to Vancouver to attend KPU. I had a few main loves in high school, mostly artistic. But I was also very into academics, so I became very interested in philosophy. Coming from the Challenge Program at Esquimalt High really helped me realize my passion for academics, something that I continued through my design schooling. I was also very taken with the music scene in Victoria. I was in about 10 different musical ensembles in high school and fell in love with Jazz through the program. Most of my time in high school was spent in the music room. And of course I was also interested in fashion and photography. I was always running off on my lunch hours to take photos with friends and putting together shoots in our spare blocks. I always loved sewing, but it wasn’t until my high school sewing teacher came along that I really became inspired to do this for a career. She knew I was passionate about sewing and I wanted to go a million miles an hour and start making dresses, but she made me sit down and learn the basics and the techniques I needed to move forward. I completed all of my electives early in high school so I could spend more time sewing. In my final year I was in the sewing room ¾ of the day. It was heaven. My interest in fashion started so early that it is hard for me to remember what age, but my mom always tells me it was from the moment I was capable, I would put together my own outfits every day and wouldn’t let them change my mind. I wore a tiara and a pink tutu on my first day of preschool. There was no convincing me otherwise. The first moment I can remember that I realized this was something I wanted to pursue was when I was 8 and my Nana signed me up for a weekend sewing class at a small store in Victoria. There were a few domestic machines set up and some fabric and I remember that when we asked the instructor how to do something, she would come over and just finish the piece for me, and it made me so angry because I wanted to do it myself so badly. So after the class finished, I went home and borrowed my grandma’s machine and started learning from there. Check out the intricate couture draping on both front and back. My family was extremely supportive of my fashion career. Aside from the fact that it was pretty obvious that was what I was going to end up doing, I came from a family of artists so pursuing this kind of career wasn’t just approved of, it was expected. Some of my friends in high school were pressured to become scientists or mathematicians or something in academics, while I grew up with my mom who is a painter, my dad who is a photographer, and my brother who is a musician. Art came naturally to us. Being able to pursue something in this field made my parents happy, and when I started pursuing photography I was able to connect with my dad’s teachings. Choosing a fashion program is very tricky because it is a craft we don’t tend to learn much about in high school. I had dreams of living in New York or London, so in my early years in high school I checked out FIT, Parsons, Pratt, and Central Saint Martin’s (reach for the stars right!). And while I fell in love with the lifestyle and the cities, I felt like there was something missing from the schooling. At a university fair in grade 11 I got brochure from Kwantlen, a school I had never heard of, and I started doing some research. At that point I was also looking into Ryerson and other Canadian programs, but something about KPU stood out. What really pulled me in was the fact that they taught not only the artistic side of fashion, but the technical side. This program puts a lot of emphasis on production and saleability of garments, something I was very interested in. A lot of other programs do a fantastic job of teaching the creative side of fashion with illustrations, colour theory, etc, but KPU also taught us how to produce factory quality pieces and how to work with production overseas. I ended up having to choose between the London College of Fashion and KPU, both of whom had offered me a place. But it was the technical knowledge and marketability aspects that really drew me to KPU in the end. The last four years have been the most insane times of my life. I had spent years being told “this year is going to get hard, you are going to have so much homework.” All through school and every year I was underwhelmed, I wasn’t challenged, and then I came to KPU. On the first day of school some older years told us that we would have dozens of hours of homework a night and we would be living at school. Of course I just laughed because people had been telling me for years, but they were absolutely right. We ate slept and breathed fashion in this program. I was so enthralled by being in a city with an actual fashion industry that any spare moment I had I was attending countless events and networking. The classes inspired me to look into different parts of the industry that I didn’t even know existed. By the time 4th year rolled around, I was spending 15 hours day sewing and producing my collection. In the final weeks leading up to my photoshoot, I was sleeping an average of two hours a night and eating 1 meal a day. But the best part was, I was LOVING it. This program felt tailor made for me, I have always had such an appetite for learning and so finally being in a place where I was learning about my passion was the best thing that could have happened to me. My classmates really made the program special for me as well. Working with these women inspired me to be a better designer and gave me the best safety net I could ask for. We all had ups and downs through the program. We are a graduating class of overachievers so we tended to drive ourselves into insanity every once in a while. But we had some incredible moments too. Plus with the lack of sleep we ended up having some hilarious moments. Toward the end of 4th year I was madly hand sewing one of my gowns. It was crunch time and I was sewing with my piece on a dress form. I had been hand sewing for about 11 hours. I was delirious and I confused myself with the dress form and literally stuck a needle a good inch into my thigh when I finished my stitch as if to say “there, done!” I was so tired I just burst out laughing. I couldn’t even feel the pain. Vesuvius was inspired by a few different things. Fabric has always inspired my design and hand sewing techniques inspired many of the looks. But the overall theme of the collection had a different inspiration. 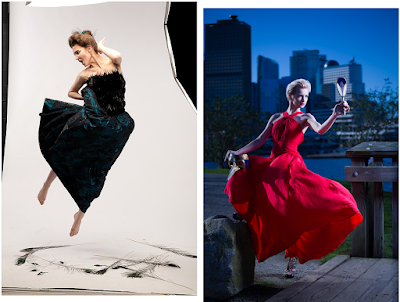 I had always known that I wanted my collection to feature evening gowns, but I wanted them to have a purpose. The main inspiration behind the collection was art. I wanted to use fashion as a foundation to celebrate local art. I collaborated with Jack Wass, using one of his paintings as inspiration for one of my gowns “Joan”, where we used his art as a print on my fabric. Combining art with fashion is very important to me and being able to celebrate local talent really relates to my personal values. Vesuvius is an exclusive collection of black tie evening gowns that fuse art with fashion, made for the entrepreneurial, self-made woman as an artistic extension of her brand. Luxurious fabrics were key in creating the looks for the Vesuvius collection. I used a lot of silk in my pieces because of the gorgeous drape and weight of the fabrics - mixing these with novelty fabrics like baroque applique’s and molten tulle. 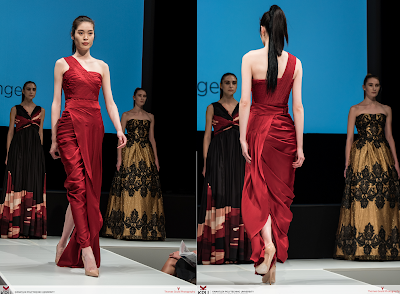 The colours of Vesuvius are scarlet, gold, blush, and black, all showcasing the rich and elegant theme inspired by trend forecasting and baroque looks. I really fell in love with each of the three looks I produced for The Show. Joan, the black printed dress made in collaboration with Jack Wass, has a special place in my heart because of the fusion of art. Amelia, the scarlet silk draped dress has my heart because of the amount of draping involved and the mixture of cowls and pleats. Jeanette, the gold strapless gowns with baroque overlay, is definitely the dress that I gave the most of myself to. This dress required so much attention to detail. Each section of the applique was hand cut and hand stitched to the delicate tulle, a painstaking process but the result was stunning. I have never been to proud of a piece as I am of that one. This is the question I am asked most as a designer. The fashion industry has become so over saturated with the introduction of fast fashion that it is very had to justify what we do, What makes my work different is my investment in art and the celebration of collaboration. I would not be where I am today without the help of some incredibly talented artists; painters, photographers, models and beyond. Being able to celebrate those connections and put value back into clothing is really what my brand represents. Fashion has always meant more than just clothes to me because it is my passion, but it is my goal to give others that expression by fusing their values and their passions with mine. 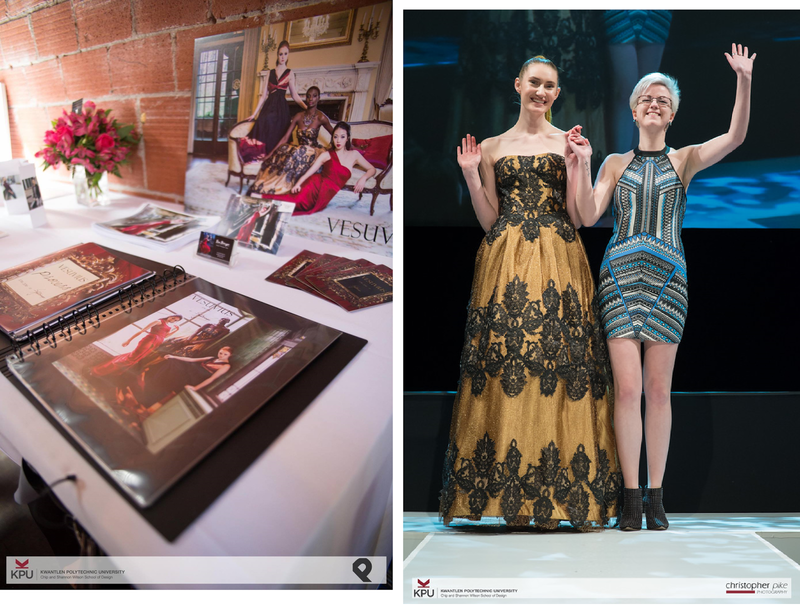 I had grand plans of taking a break from fashion and working in other fields this summer, but that just doesn’t happen when you launch yourself at a show like the KPU grad show. 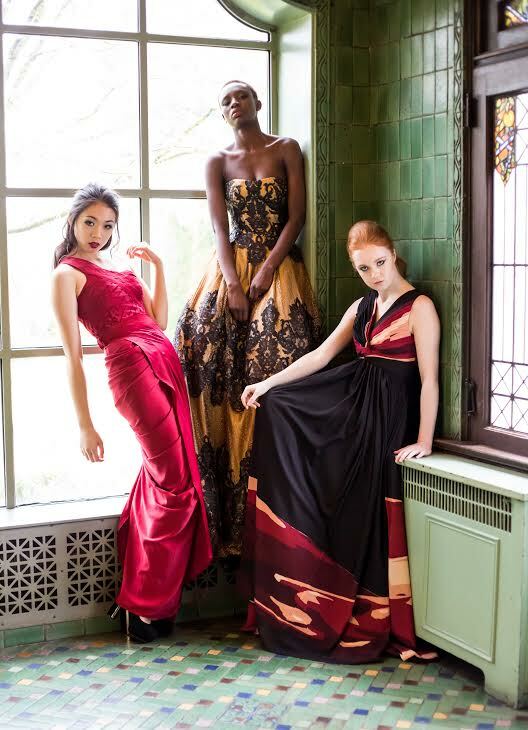 I have had some incredible opportunities come along and have accepted an offer to produce my full collection, so I have decided to dedicate my time to sewing full time this summer in order to do so. My collection will be launched this September and I am hoping from there to start taking on some custom clients and making individual pieces for local women. “Fashion is the armor to survive the reality of everyday life” – Bill Cunningham. This quote has inspired me in so many ways since I began designing. It is something I always keep in mind in my work, because fashion means something different to everyone. I think this can be applied to so many different sets of values. Collaboration is something I value more than most things in my life/ I love the chance to work with new people! Send me a message or follow my work for more updates!